The statistics and charts presented here compare the magnitude of MVI claims across the seven WorkSafeBC sectors and 24 subsectors. WorkSafeBC further classifies every business into approximately 550 classification units however that level of detail is not presented here. Search the list of sector and subsectors to see the classification units they contain. 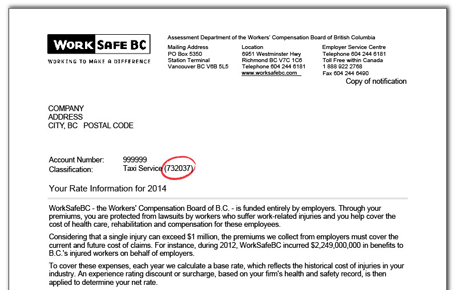 Then check how WorkSafeBC sets rates for more information. To find the sector, subsector and classification unit you’re registered in, go to worksafebc.com and log in to their system by selecting the log in/create an account link on the upper right-hand side of the page. You can also find your classification unit in your annual rate notification letter which is sent to all registered businesses in the fall of each year. In this example, the business is in sector 73 which is Transportation and Warehousing, subsector 7320 which is Transportation and Related Services and classification unit 732037 which is Taxi Service.